Reinteract is a system for interactive experimentation with Python. 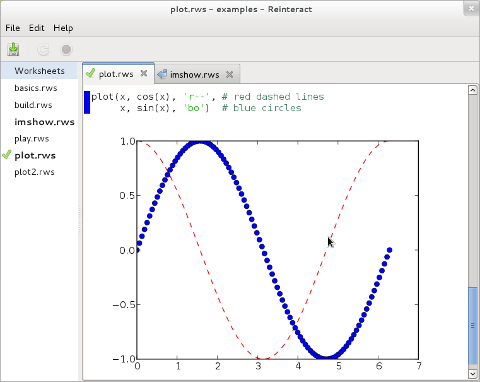 Reinteract worksheets contain Python code combined with the results of that code, formatted as text or graphical plots. Youu can go back and edit previously entered statements, and the results will update. Reinteract is suitable for experimentation with the Python language and for data analysis using the NumPy and SciPy packages. Reinteract is Free Software. The source code to Reinteract is available under the BSD License. It’s easy to download and install Reinteract for Microsoft Windows, Mac OS X, or Linux. There is a Reinteract Google Group for discussion.